In this weeks collection video I take a look at the next two statues in the First 4 Figures series, these ones being the Goron Tunic Link Statue and the Zora Tunic Link Statue. 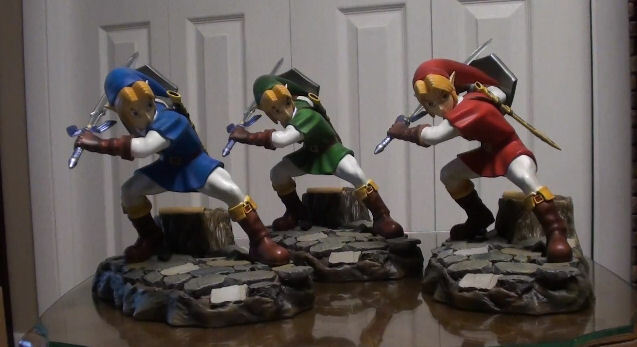 These were directly modeled after the previously released Ocarina of Time Link Statue. At a limited run of 1250 for each, these items are slightly more rare than their Green Link counterpart. However, since they were released over two years later, they aren’t as old, and thus, haven’t become as sought out as the Green Link. Despite there being double the amount of statues available, the Green Tunic Link statue is still the most expensive of the bunch. You can occasionally find the Goron and Zora Tunic Link statues on eBay, usually selling for somewhere in the range of $300 to $400. Go ahead and make the jump to check out the collection video.